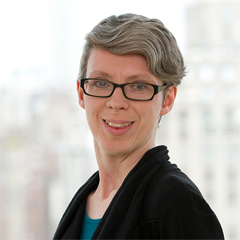 Amanda Watson is an academic librarian, specializing in reference, library instruction, faculty outreach, and collection development in the humanities. Her current research project, tentatively titled Original and Selected: Commonplace Books, Readers, and Poems in Nineteenth-Century America, is a study of the poetry-reading practices of American readers between the early years of the nineteenth century and the dawn of the twentieth century, as seen through the evidence of commonplace books from this period. She examines the data from a sample of fifty or so commonplace books and discusses larger patterns of poetry reception that can be discerned in them: the rise and fall of particular poets, the immense popularity of fugitive and ephemeral verse, the persistence of poets who were perceived as especially “quotable.” She also looks more closely at smaller-scale case studies, including that of four members of the same family who all kept commonplace books, with many of the same poems in common. She is particularly interested in the tension between ideas of the commonplace book as a repository of frequently-quoted (literally “commonplace”) materials written by others, on the one hand, and the commonplace book as a unique expression of its compiler’s personality, on the other.